I shall at all times consider the rights of others as well as my own. I shall work to ensure that the exercise of my rights does not impede upon the rights of another, especially their right to exist. 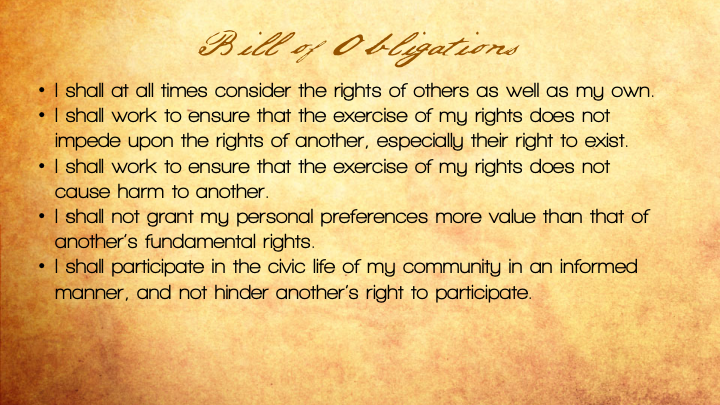 I shall work to ensure that the exercise of my rights does not cause harm to another. I shall not grant my personal preferences more value than that of another’s fundamental rights. I shall participate in the civic life of my community in an informed manner, and not hinder another’s right to participate. After the service, I heard from a few of you about what you’d add to such a bill. Still more of you went home with quite a bit to think about. This week, I’d love to hear your thoughts on the topic. If we had to enumerate our responsibilities to one another as citizens (or as members of a church community), what would you include? What should a covenant among free individuals gathered in community look like?